Let us be frank with you. The image that you hold of astronomers -- that they are nerdy guys and gals who sometimes wear black socks with sandals -- is mostly true. However, occasionally, you find someone who breaks this mold, someone like Frank Cianciolo. Frank is the "Senior Program Coordinator" of the McDonald Observatory Visitors Center. Basically, he ensures that the people who visit this mecca for astronomy have everything that they need. "That's not a reason to go into medicine." 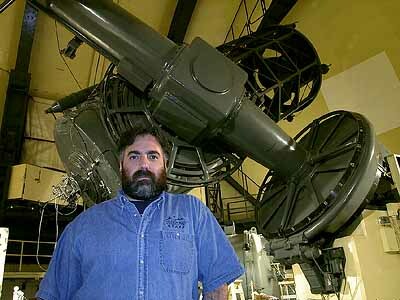 Frank grew up in southern Ohio and, at an early age, became interested in astronomy. He often attended the planetarium in Cincinnati, and his parents gave him his very first telescope before he could drive. After high school, however, he was a pre-medicine student at The University of Dayton in Ohio. His father was a medical doctor, so certainly Frank felt some expectation to be one as well. "That's not a reason to go into medicine," Frank says. After Dayton, Frank "fooled around for a while." For two years, he worked as a bartender. Then, he moved to Alaska for a summer where he worked on a fishing boat. "I don't really recommend it," says Frank about this occupation that is usually grueling and often dangerous. "I just never knew that you could know much about it unless you were Einstein." In 1984, Frank heard that Halley's comet would become visible in 1985 (and become very bright in 1986, as it passed Earth in its 76-year cycle). He wanted to see it, but he realized that he barely knew where the Big Dipper was in the sky. Disappointed in his lack of knowledge but determined to learn, he started to read books about the constellations, learned star charts, and became well versed in amateur astronomy. Frank muses, "I had always been interested in astronomy. I just never knew that you could know much about it unless you were Einstein." "What the heck? I'm not doing anything." A few years later, one of Frank's friends was visiting Texas A&M University. He said, "Hey, why don't you come with me. I hear UT has a good astronomy program," to which Frank replied, "What the heck? I'm not doing anything." One of the first people Frank met was Dr. Mary Kay Hemenway, who became his mentor. She counseled Frank in what he needed to do before coming to study astronomy at The University of Texas at Austin. "I fell in love with the Observatory and Ft. Davis." As an undergraduate student in his first year, Mary Kay approached Frank with the suggestion he apply for a summer internship at McDonald Observatory. She knew of Frank's experience in amateur astronomy and thought he might enjoy such an job. "I fell in love with the Observatory and Ft. Davis," says Frank of that summer, and, in the subsequent semesters, he would travel there again and again to stare at the heavens and share this awe with others. In 1994, a full-time position opened up which Frank applied for and quickly accepted. Since then, over 10 years have passed and Frank has seen the Visitors Center morph into the pride of Texas where thousands of people visit every year. This is awfully gratifying to Frank who revels in knowing that, for many, the first time they look through a telescope is under his guidance.